Turning brains invisible clearly has its advantages. Find out how a transparent brain caught my eye, what makes thempossible, and why they may be the right method for you to use! In the first MiNDS colloquium of 2015, Dr. Sheena Josselyn gave an excellent talk about her work linking CREB-expressing neurons with memory formation. At the end of her talk, Dr. Josselyn talked about an exciting new technique that she has used in her lab to turn a mouse brain transparent. Josselyn was quick to credit Dr. Karl Deisseroth as the creator of this amazing technique, called CLARITY. In a powerful display of CLARITY, as well as an homage to its creator, Josselyn presented a slide with two photos of Deisseroth placed side by side. 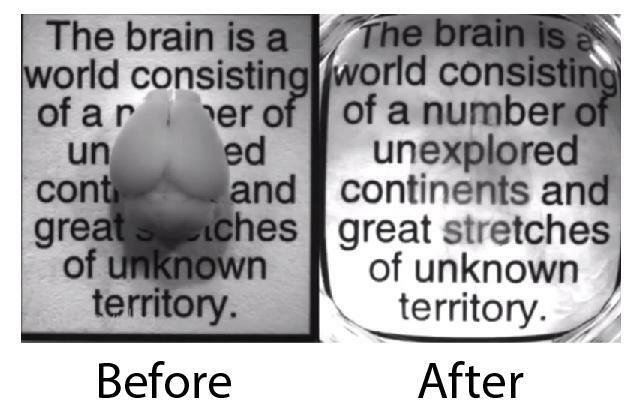 In the first photo, part of Karl’s face was obstructed by a mouse brain, while the second photo showed the same picture of Karl, but without obstruction. Dr. Josselyn told the audience that both photos have the same mouse brain in front of Karl’sphoto, with the difference being that the first photo was taken before the mouse brain was rendered completely transparent by the CLARITY technique. This was an extremely powerful way to present a very hot topic in the realm of neuroscience techniques. While invisible brains seem like something out of a science fiction movie, clearing organs is not exactly something new to the health sciences. A challenge faced by many neuroscientists is that structures located below the surface lie just out of reach of most microscopy techniques, and researchers have to resort to slicing the brain in order to understand these subcortical neuronal networks. Then, after these slices are analyzed, they must be re-aligned, and re-assembled into a three-dimensional structure, which is a very difficult and time-consuming task. A transparent brain, on the other hand, is so tantalizing because it maintains three-dimensional neuronal networks and allows subcortical areas to be studied in the intact organ. Because of its high lipid content, the brain does not allow light to pass through, making it very opaque. Most clearing techniques render tissue transparent by extracting these lipids through the use of detergents. The challenge here is that detergents not only remove lipids, but they can also degrade or remove biomolecules of interest, such as proteins or DNA. To overcome this hurdle, Dr. Deisseroth first soaked his brain samples in a hydrogel-monomer solution of acrylamide, which binds directly to these biomolecules of interest. After the sample had been completely infused with acrylamide, he applied heat, which forms a ‘hydrogel meshwork’ between the acrylamide molecules and the tissue itself. Finally, Deisseroth washed his brain in detergents to remove the lipids, leaving behind a ‘hydrogel-tissue hybrid’ that was not only completely transparent, but contained more biomolecules than other clearing techniques. Some of the greatest advantages of this technique are that Deisseroth’s CLARITY can be used to effectively clear brain tissue with less biomolecule loss compared to other techniques, great structural integrity of cleared tissue, and a relatively fast clearing time. Because the biomolecules remain attached to this hydrogel-meshwork, scientists can even probe and re-probe their samples. There are many applications for this technique, which will allow scientists to better understand neural connections, and we have only begun to scratch the surface. Dr. Josselyn clearly understood the utility of such a technique and employed it to image subcortical neuronal subpopulations in her mouse brains. Dr. Deisseroth has already gone as far as to apply CLARITY in the post-mortem brains of human! Chung, K., Wallace, J., Kim, S.Y., Kalyanasundaram, S., Andalman, A. S., Davidson, T. J., ... &Deisseroth, K. (2013). Structural and molecular interrogation of intactbiological systems. Nature, 497(7449), 332-337.